In part 1 of this series I demonstrated how to modify the values of a list box and access data I was not given access to by manipulating the view state and event validation parameters. Remember, the key to this is that ViewStateMac must be disabled. In this post, I will be demonstrating triggering button events that are not available to me. The target application has a simple screen that has a drop down list with some transactions and a button to view the selected transaction. 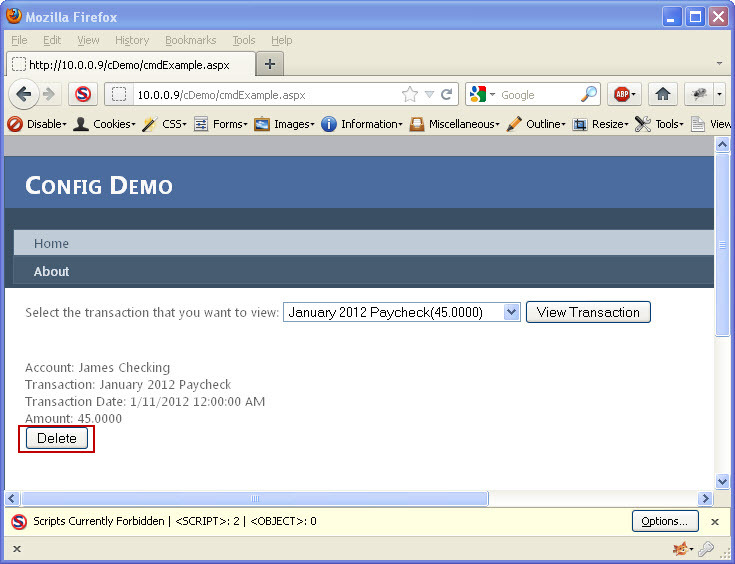 When a user selects a transaction and clicks the “View Transaction” button, the transaction is loaded (see Image 2). 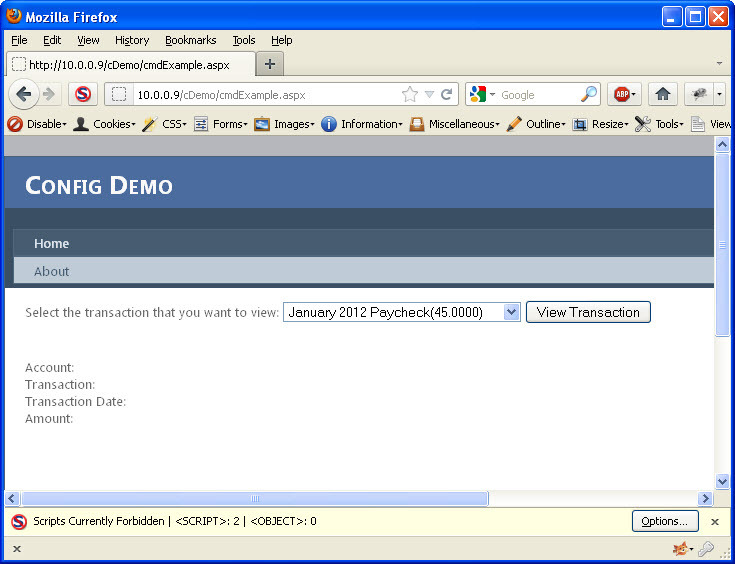 As seen in Image 1 above, some users have access to delete the selected transaction. 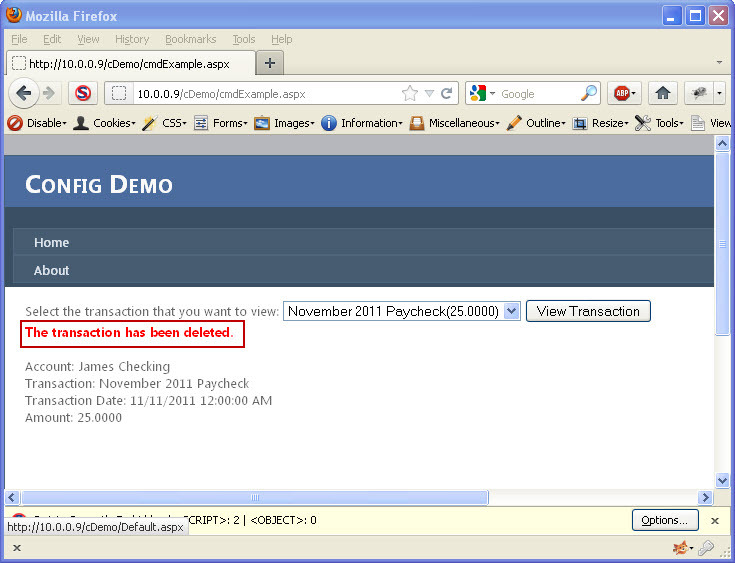 Image 3 shows what happens when we delete the transaction. 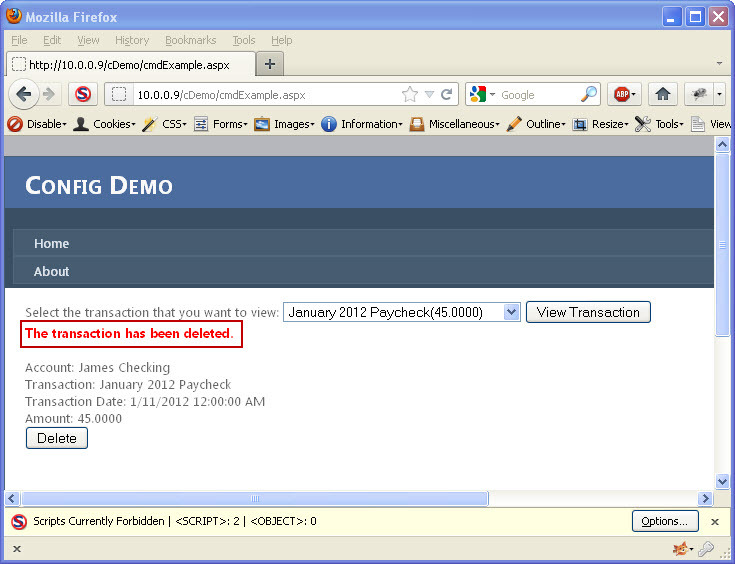 (For this demo, the transaction is actually not deleted, a message is just displayed to make things simple. Unfortunately, the account I am using doesn’t allow me to delete transactions. Lets take a look at how we can potentially bypass this so we can delete a transaction we don’t want. I will only be using Burp Suite Pro and my custom Event Validation tool for this. Other proxies can be used as well. Lets take a look at the page as I see it (See Image 4). I will click the “View Transaction” button and view a transaction. Notice that there is no “Delete” button available. When I view the source of the page (Tools…View Source) I can see that the id of the “Get Transaction” button is ctl00$MainContent$cmdGetTransaction. In some cases, I may have access to the details of the delete button (that is currently invisible). In most cases, I may be stuck just making educated guesses as to what it might be. In this case I do know what it is called (ctl00$MainContent$cmdDelete), but one could easily make simple guesses like cmdDelete, cmdRemove, cmdDeleteTransaction, etc.. I like to avoid doing any url encoding myself, so my first step is to change my proxy into intercept mode and select a transaction to view. I want to intercept the response so that I can modify my __EVENTVALIDATION field before it goes to my page. I need to add in my button to the __EVENTVALIDATION so that ASP.Net will accept it as valid. I will use the custom Event Validation tool to do this. 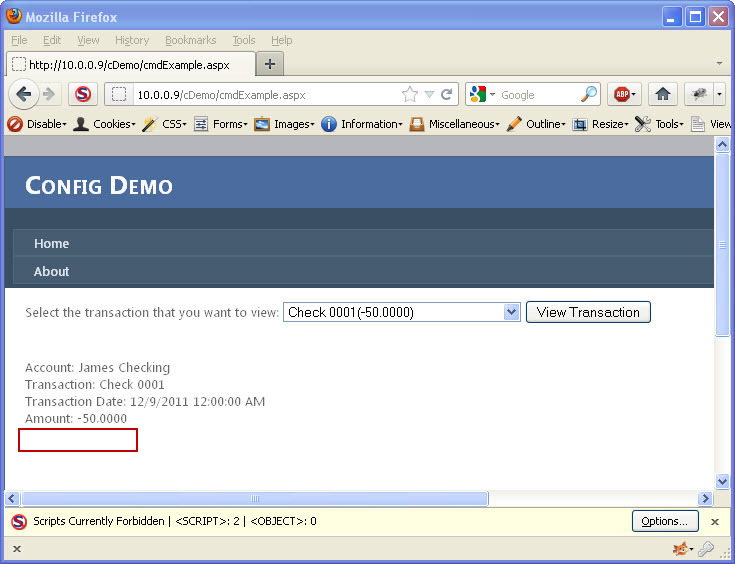 Image 5 shows the Event Validation application with the needed changes. After modifying the __EVENTVALIDATION field, I will update that in my intercepted response and then let the page continue. Now that I have modified the data on my current page, the next step is to Click the “View Transaction” button again to trigger a request. The triggered request is shown in Image 6. This request is triggering a “View Transaction” request, which is what we do not want. We need to change this request so that it is calling the “Delete” command instead. You can see the change in Image 7 below. When I continue the request and turn my intercept off I can see that my delete button click did fire and I get the message alerting me that the item was deleted (Image 8). Since this is using a drop down list to define the transaction we are dealing with, I could combine the concepts from Part 1 in this series to delete other transactions that may not even be mine. 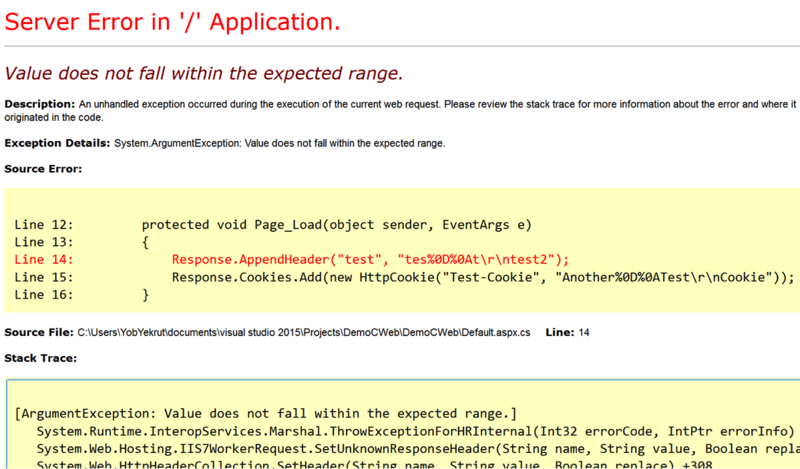 There are a lot of possibilities with tampering with the Event Validation and View State that can cause big problems. This is an overly simplified example of how events that are meant to be hidden from users can be triggered when ViewStateMac is disabled. It is important that if you are changing the visibility of buttons or other controls that trigger events based on users roles, that the actual event checks to make sure that the current user is authorized to perform its function. 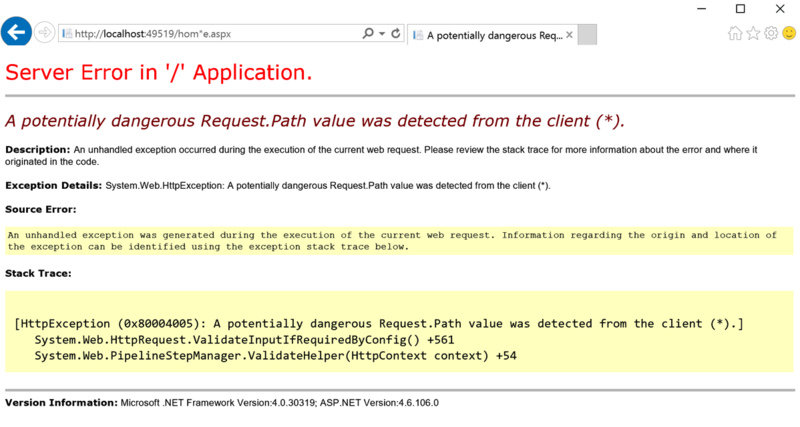 I personally like all of the built in security features that .Net has, but no one should rely solely on them. Of course, there are multiple factors that go into this vulnerability, so if things are not just right, it may not work. This information is provided as-is and is for educational purposes only. There is no claim to the accuracy of this data. Use this information at your own risk. Jardine Software is not responsible for how this data is used by other parties. UPDATED 12/13/2012 – This post was updated to include a video demonstration of tampering with data with Event Validation enabled. The video is embedded at the bottom of the post. My last post brought up the topic of tampering with Event Validation (__EVENTVALIDATION) and how it is protected with the ViewStateMAC property. This post, and the next few, will focus on how to actually tamper with the values in Event Validation to test for security vulnerabilities. We will use a very basic demo application to demonstrate this. The target application has a simple screen with a drop down list, a button, and a data grid that displays the selected account information. The drop down list is populated with accounts for the logged on user only. I will show how the data can be modified to view another account that we were not granted access to. It is important to note that there are many variables to requests and this assumes that authorization was only checked to fill the drop down list and not when an actual account is selected. This is a pretty common practice because it is assumed that event validation will only allow the authorized drop down items (the accounts in this instance) to be selected by the user. Not all applications are written in this way, and the goal is to test to see if there is authorization or parameter tampering issues. I will use multiple tools to perform this test. These tools are personal choice and other tools could be used. The first, and my favorite, is Burp Suite Pro. This will be my main proxy, but that is just because I like how it works better than some others. Secondly, I will be using Fiddler and the ViewState Viewer plug-in to manipulate the View State field. Finally, I have a custom application that I wrote to generate the Event Validation codes that I need to make this work. First, I will just load the application and view the target page. Image 1 shows the initial screen with the values from the drop down list. Notice that only 3 accounts are available and they are all for James. By looking at the source for the drop down list, I can see that the values for each of those items are numeric. This is a good sign, for testing purposes. Numeric values are usually easier at determining, especially if you can find a simple pattern. Next, it is time to de-serialize the view state so we can modify it for the value we want to add. To do this, I will use Fiddler and the ViewState Viewer plug-in. There are two changes I need to make. First, I need to add an item to the ArrayList (seen in Image 2). Second, I need to add the drop down list item I want to try and access. The text will not matter, but the value that I add is the key. 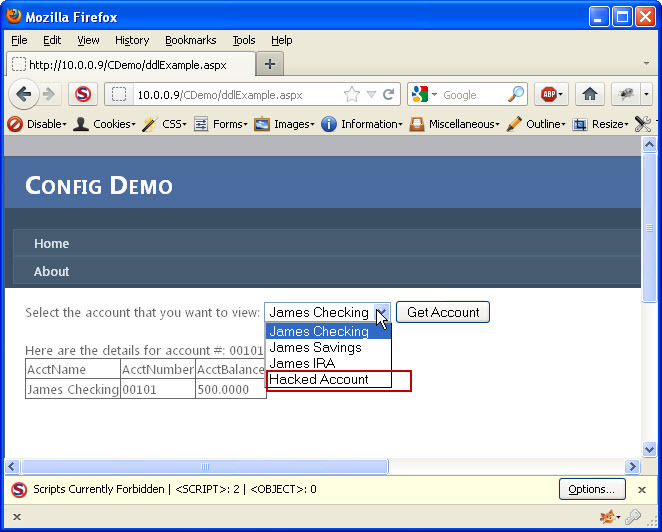 Although this may not always be the case, in this simple example, that is what the application uses to query the account data. The value needed could be known, or you could just attempt to try different values until you find one that works. The added item can be seen here in Image 3. Use my custom application. This is the method I will use for this example. See Image 4 for a reference to the application. I will retrieve the __EVENTVALIDATION value from the response and paste it into the Original Event Validation textbox and “De-Serialize” it. This will populate the list box with all of the original hash values. To add custom data, we must use the same technique that the ASP.Net uses to calculate the hash value for the items. There are two values we need to modify in this example. First, I need to modify our allowed viewstate hash. 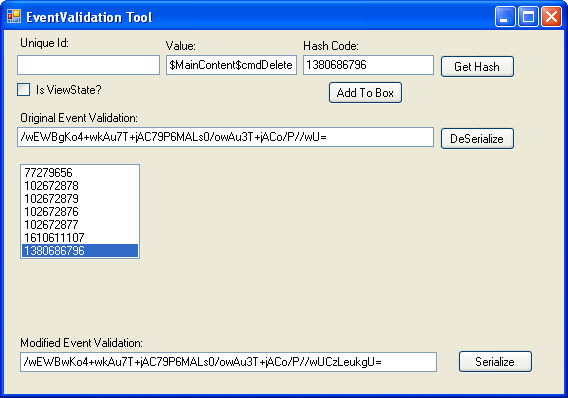 To do this, I will put my modified __VIEWSTATE value into the “Value” textbox and click the “Get Hash” button. 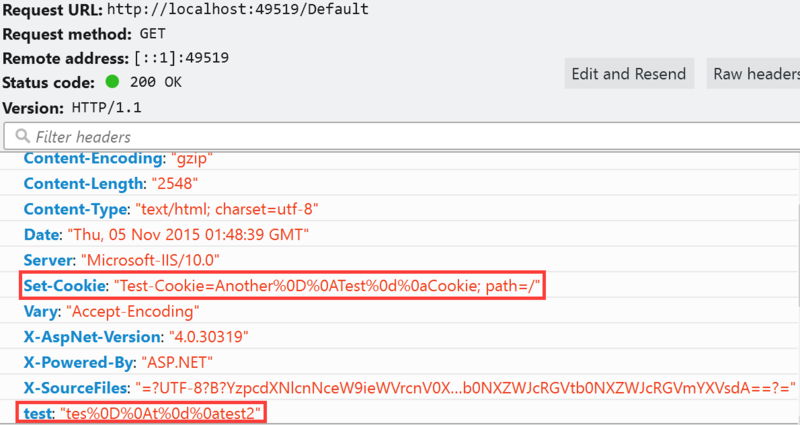 View State is a little different than other control data in that it does not require a Unique Id to be associated with it to generate the hash. The hash value generated is 679154845. This value must be placed in the first array item in event validation. Second, I need to add my own drop down item. Previously, I added this to the view state and used a value of 00201. Adding it to event validation is a little different. I will enter in the value (00201) into the “Value” box, and then enter the drop down lists unique id (ctl00$MainContent$ddlAccounts) into the “Unique Id:” textbox. Clicking the “Get hash” button produces the following hash: –439972587. I then add this hash value to the array. Due to the time it can take to perform the above steps, I like to do them without holding up my request. Now that I have the values I need, I will refresh my page with my proxy set to intercept the response. I will then modify the response and change the __VIEWSTATE and __EVENTVALIDATION values to my new modified ones. I will let the response continue to allow my page to display. I now need to determine if I was lucky enough to pick a valid account number. I will select the “Hacked Account” list item (which is the one I added) and click the “Get Account” button. If no data comes back then the account number did not exist. It is back to the drawing board to try again with a different number. If, however, account details did show up, then I have successfully accessed data I was not given access to. Image 6 shows the results of a successful attempt. This showed the steps necessary to manipulate both view state and event validation to tamper with the allowed accounts were were authorized to see. This requires that ViewStateMAC is disabled and that the view state has not been encrypted. If either of those two factors were different, this would not be possible. This demonstrates the importance of ensuring that you use ViewStateMAC to protect your view state AND event validation. You should also be performing authorization checks on each request that requests sensitive information from your application. This example application is completely fictional and there are no claims that this represents the way that any production application actually works. It will be used to demonstrate the different techniques used to develop applications to understand how they can be fixed.